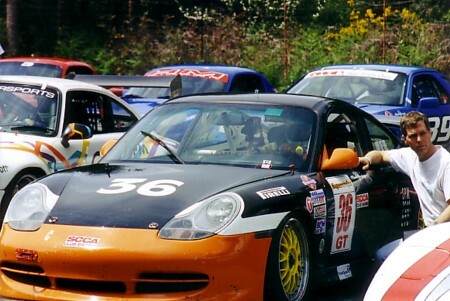 May 23rd through 25th I raced at Pacific Raceways in Auburn. For the final day, Amy and Rob Scheibe accompanied me, helping me keep the car in running order, cheering me on...and taking photos. At right, Rob waits with me in the paddock before the race begins. Most valuably, he delivered a last-minute cup of coffee! 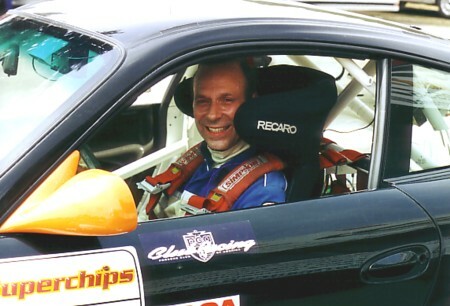 As a result of my finish in the time trials the previous day, plus some strategic maneuvering by two other drivers, I was able to start in the pole position. 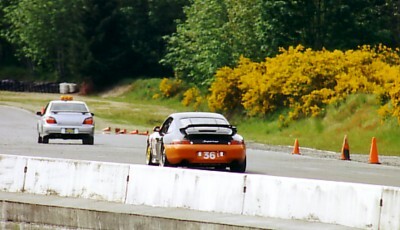 At left, I'm following the pace car for a first lap before the race starts. 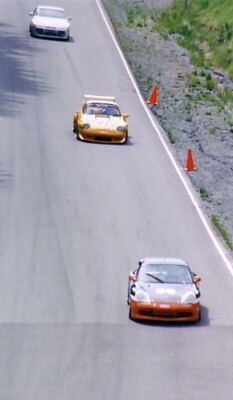 Early in the race, for the first couple laps, many of the cars remain fairly close together. Over the course of the race, they tend to spread out. 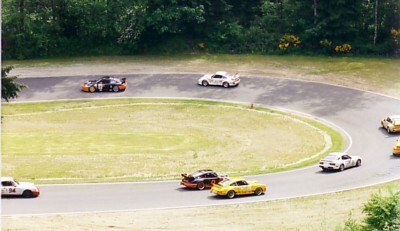 At right, a lot are bunched behind me in turn three. 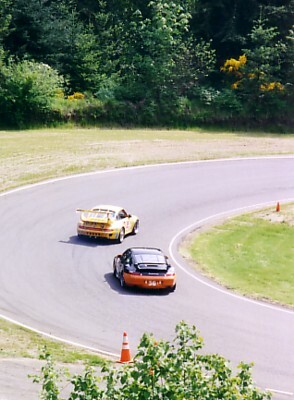 Pacific Raceways is a fun course to race, with numerous turns and long hills on the back side of the track [below]. Unfortunately, most race fans don't get to see the action along the best part of the track unless they take a hike. Rob is always a great help when he comes to the track. I really appreciate his expertise and enthusiasm. 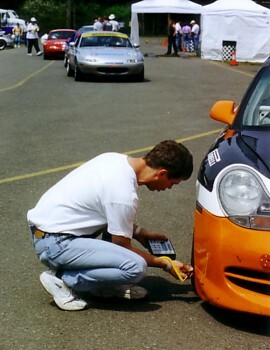 At left, he's checking my tire temperature immediately after I've pulled off the track. Tire temperature is absolutely crucial and is affected by tire pressure, pavement temperature, and ambient air temperature. If tires are too cool, there isn't enough traction to hold the car to the pavement, especially important in turns. If the tires are too hot, they can get too sticky, and they also wear out faster—which means more expense. I'm still working to find the ideal formula of temperature and pressure that will allow a set of "slicks" to last as long as possible. With all the clothes I have to wear, the helmet, and spring and summer temperatures—not to mention the adrenaline—it gets pretty steamy in the car [right]. This is despite the fact that a large hose blows air into my face while I'm driving. At Auburn this year I didn't win any races, but I finished well considering the competition and was pleased with my performance. Thanks, too, to Amy and Rob!